We’ve got the specs and details for the 4k Ultra HD Blu-ray release of Point Break (2015). The film, already available on conventional Blu-ray Disc and Digital HD, will hit stores on Tuesday, June 7th. The Ultra HD Blu-ray Combo Pack from Warner Bros. will carry a suggested retail price of $44.95 (likely to be priced at $29.99). The Ultra HD edition from Warner Bros. brings four times the resolution of standard Blu-ray, with 4k video presented in 2160p using the HEVC/H.265 compression standard. 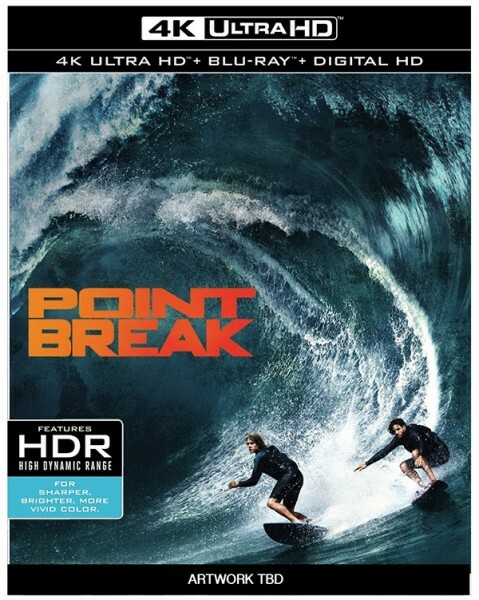 For those who own a 4k TV that supports High Dynamic Range (HDR), Point Break on UHD BD will also include the new HDR specification for deeper color depth, wider range of black to white, and more realistic imagery. The extra bonus material on Point Break includes deleted scenes, as well as the featurettes “Rock Climbing,” “Wingsuit Flying,” “Snowboarding,” and “Motocross” — presented in Full HD (1080p) on the Blu-ray copy. Point Break stars Édgar Ramírez (Zero Dark Thirty, The Bourne Ultimatum) as Bodhi, and Luke Bracey (G.I. Joe: Retaliation,November Man) as Johnny Utah, along with Teresa Palmer (Warm Bodies), Delroy Lindo (Sahara, Gone in Sixty Seconds) and Ray Winstone (Noah, The Departed), under the direction of Ericson Core (Invincible). The film is replete with the most daring athleticism ever seen in a motion picture. The action adventure feats were performed by elite athletes representing the world’s best in class in big-wave surfing, wingsuit flying, sheer-face snowboarding, free rock climbing and high-speed motorcycling. Core directed Point Break from a screenplay by Kurt Wimmer (Salt, Law Abiding Citizen), with a story by Rick King, W. Peter Iliffand Kurt Wimmer. Alcon principals Andrew A. Kosove and Broderick Johnson produced the film alongside producers John Baldecchi, David Valdes, Christopher Taylor and Kurt Wimmer. John McMurrick, Dan Mintz, Wu Bing, Robert L. Levy and Peter Abrams served as executive producers, with co- producers Henning Molfenter, Charlie Woebcken and Christopher Fisser.